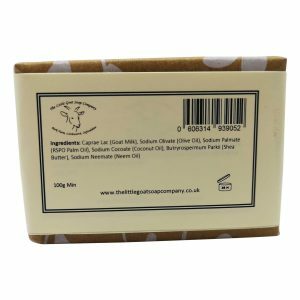 Simply a pure bar of wonderful goats milk soap for those who prefer their soap fragrance free. I came across this soap at a summer fair recently. It claimed to help eczema which my 18 month old son is suffering from (a mild version). We have tried all sorts to treat it, but whilst some products relieve it, his skin has always been very dry and rough to the touch and he used to itch a lot. I thought I’d give this soap a go but wasn’t convinced it would make a difference. However within 2 weeks my son’s skin is completely normal. I’m very surprised and extremely delighted – just about to place a bulk order! 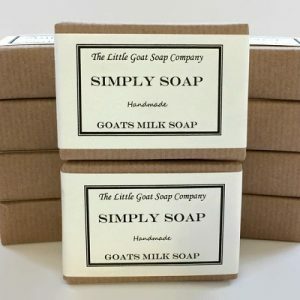 Thank you little goat soap company! This soap is absolutely gorgeous, and I love it!!! It is very silky and leaves your hands feeling the same. It is so good for your skin especially in this very cold weather. Because I have mature, dry skin, they tend to crack and sometimes bleed in the winter. 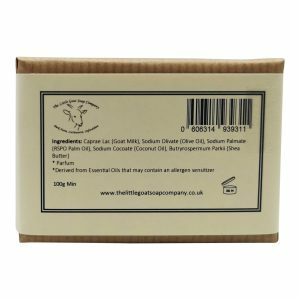 It is not happening with this lovely natural soap. Will never go back to using any other commercial soap again. I have just put in my second order of 2 packs of 3 to make sure I don’t run out! Also, like one other review, I have rosacea and, because it is so pure and natural, I am going to try it on my face. 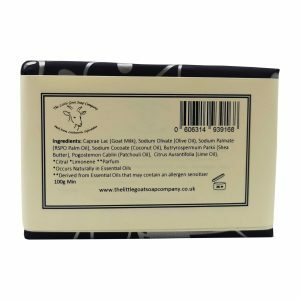 Thank you so much Jo for this lovely soap, and sweet thanks to the lovely goats who produce it. Was recommended the simply soap by a friend for my toddler who suffers from dry skin and eczema on her legs. This is the only soap/bath product I can use for her, it’s fantastic. It hasn’t cured the eczema completely but she doesn’t scratch herself as much now and doesn’t say ‘mummy sore’ so thankyou thankyou. Just put an order in, plus one for myself to try. Purchased this soap for my four year old who has severe eczema. After spending so much money on every lotion going this has been the best purchase I have made!! It instantly calmed her skin down and after a few days the redness and dryness have dramatically improved!! I can’t wait to see after a week what her skin will be like!! Thank you so much for your super fast delivery, excellent packaging of the soap and the lovely extra little sample!! Will be ordering lots more and have recommend your soaps to family and friends. Thank you. Will explore your other products too thank you.